U.S. industrial designer born in Russia and as a child, immigrated to the U.S., where he attended the City College of New York and New York University. He later attended the Art Students League in New York, and served in the U.S. Army during World War I. He was hired as an advertising copywriter, and eventually promoted to director of advertising. In the late 1920s, he established the firm of Design Engineers in Manhattan, which developed patents to be sold to manufacturers. In 1930, he designed the Beta Chair, a modern design using steel, chrome-plated tubing, for the Howell Manufacturing Company. He was a member of the American Union of Decorative Artists and Craftsmen (AUDAC) formed in 1927, and displayed his designs at its 1931 exhibition, Modern Decoration and Design, at the Brooklyn Museum. The Beta Chair was also exhibited at the Museum of Modern Art’s 1934 Machine Art Exhibition. 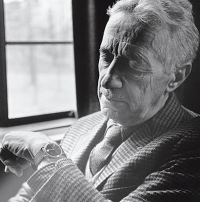 In 1947, he designed a wristwatch with a round, black face without numerals, symbols, or lines marking hours or minutes, with only a single gold dot marking the 12 o-clock position, manufactured by a Switzerland firm. The design was copied by Zenith Movado without credit or compensation to Horwitt, a prime example of design piracy. It would take 27 years until Movado finally settled with Horwitt for $29,000 in 1975. In the meantime, the watch was included in the permanent collection of the Museum of Modern Art in 1960, and became known as the ‘Museum Watch.’ In 1969, Horwitt used the design in wall clock No. 4601 for the Howard Miller Clock Company. Horwitt retired to his farm in Stockbidge, Massachusetts, which between 1945 and 1948, was used for training excerses of the Jewish underground force, the Irgun. Horwitt supported the creation of the State of Israel, and served as a member of the American League for Free Palestine., and for these efforts, was awarded the Jabotinsky Medal by the prime minister of Israel, Menachem Begin.